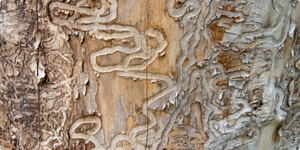 The Emerald Ash Borer (EAB) is an invasive pest that arrived in North America from Asia prior to 2002. 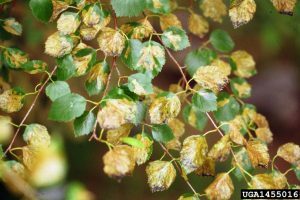 Since its discovery in the Detroit area in 2002 EAB has killed millions of ash trees in several American states and in Ontario. EAB is now known to exist in most of southern Ontario. EAB attacks all species of ash trees and the Canadian Food Inspection Agency considers the insect to be a major economic and environmental threat to urban and forested areas in both the USA and Canada. 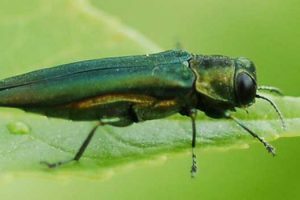 The City of Toronto estimates that within the City EAB will kill most of the ash trees located on both private and public lands by 2015-2017. To date, large scale measures to control EAB have everywhere been ineffective. While the situation at this time appears dire, there are measures property owners with ash trees can take to preserve individual trees. Injection with the systemic insecticide “Tree Azin” can provide effective control of EAB for two seasons. “Tree Azin” is made from extracts of Neem tree seeds and is currently registered for emergency use in Canada. “Tree Azin” is also exempt from Ontario’s Cosmetic Pesticide Ban Act. “Tree Azin” is most effective if applied to ash trees prior to an EAB attack. Trees already infested with EAB may be saved if less than 25% of the crown is dead. “Tree Azin” is not effective when more than 25% of the crown is dead. Contact us if you have an ash tree you wish to preserve and we will provide you with a free estimate.